12.00 sharp at the White Hart was the arrangement so we arrived at 12.20 sharp, as James “Desperate Dan” the Landlord may have known. That Nice Late Decorator has turned being late into an art form. She has no end if innovative and often brilliant ways to ensuring she is never on time, a habit that infuriates me as, believe it or not, I like to be punctual. Much like the Wingco, she does not seem to understand the concept keeping to an arrangement where a time frame is involved. She should have been Dr Who to enable her to go back in time for any appointment. With me standing dressed and ready to leave, “I’ll be 2 seconds” is a sign for me to put the kettle on and sit down “I’ll be 2 minutes” is code to go over to the Co op and buy a paper and settle down on the sofa for a quarter of an hour, 5 minutes and I may as we’ll go for a nap and dream about new customers for Currencies Direct. Anyway, eventually we got to the pub, ready for the trip over to deepest darkest Shoreham On Sea for lunch with James and the beautiful Mighty Omega. Before sitting down to lunch we had planned to take in Shoreham and a few of its pubs. A horrid industrial shell surrounds a really pretty and quaint town centre with a cozy feel of being back in the 1950’s. First stop was the very pretty and particularly low ceilinged Marilipins. 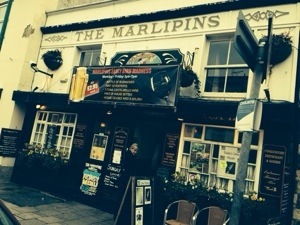 I asked what a marlipin was, and got some garbled nonsense about it having some nautical associations, perhaps not surprising seeing as we were on the mouth of the River Ader where it meets the sea, but no one could tell me what it was. Googling it on my phone was no more enlightening except to reveal that there is a Marlipin museum in the High Street, but it was closed being a Sunday so I still no wiser. It was however a nice little pub, serving a decent pint of London Pride but ruined by the recent addition is screens on every wall. Next up was The Bridge, a Fullers house with nothing else but the beer to recommend it except its commanding position on the river and attractive outside sitting area, however as it was about 6 degrees Celsius, breezy and dreary, we drank up and left quickly. Next stop, I think, (the beer was beginning to work its usual magic) was the initially rather unprepossessing and recently renamed Piston Broke (it was until recently known by the far more appropriate Lazy Toad) but had a surprisingly large selection of real ales on tap. No Pride though so I was forced to try some Bishops Finger, which sounds like a type of ecclesiastical abuse. I wonder if the Reverend Jeff has ever (can I say this?) come across it? Anyway once I had been properly fingered there was just one more place to visit on the way to lunch, where we were joined by the cook herself. I think it was called Suters Yard and was another nice pub with a lovely atmosphere, although it is fair to say that I had become quite mellow by that time. Then back to the Mighty Ones fantastic rooftop flat with views out across the river to the sea in one side and up to the Sussex Downs on the other. Now I understand why she keeps it and has refused to be drawn when I have been rude about Shoreham. I take it all back, the centre of Shoreham is lovely, but there is still the problem of getting to it through the industrial wasteland that encircles it. Once in though, it is charming and a lovely lunch ran on into the evening in a haze exacerbated by of a magnum of 2007 Medoc. ← A Shoreham it’s OK? He’d serveBishop’s Finger as well !! Said ” Girls ? You know I adore ’em ! Bad Bishop ! !….so little decorum !! She is frequently “fashionably late”. And be just that bit late through the gate. Very good Patrick . Not insipid at all ! In light of recent revelations I’m revising the second limerick. Said ” Boys ? How I love to explore ’em ” ! Bad Bishop !! No sense of decorum ! !